Out of It was a commission for British Airport Authority, organised and managed by Public Art Development Trust (P.A.D.T.). Out of It was a ten-screen site-specific video installation work installed for eighteen months at Pier 4A, Heathrow Airport, London. Pier 4A connected flights to the terminal was designed by prominent British architects Nicholas Grimshaw with design features and details reminiscent of a aircraft fuselage. Out of It consisted of a number of short video vignettes acted by airport staff volunteers, who played actions such as sleeping, rummaging in luggage, ecstatic dancing in the empty and deserted walkway at night-time. Each action has recorded by a single tracking shot using the travellator as a camera dolly. The result is that the duration of each vignette matched the travel time through the space. The compiled videos were played back on a series of overhead monitors in the space. 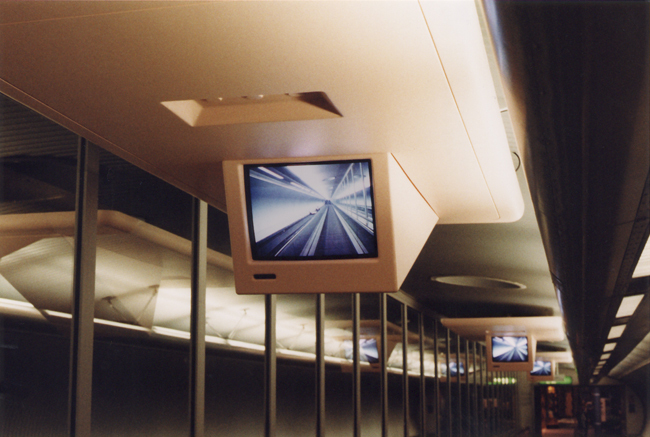 In keeping with the aeronautical theme of architecture, the video monitors were installed in custom designed fibreglass ‘ceiling units’ that reminiscent of drop-down in-flight TV displays of the time. Public Art Development Trust commissioned a number of artist’s projects for Pier 4A Heathrow in the late 1990s including Phillip Napier, Francis Hegerty, Louise Walsh, Maurice O’Connell, Andrew Kearney, Michael Minis, Mick O’Kelly amongst others.